Since 2016, SnSnap’s services have been introduced at all Yomiuri Giants games held at Tokyo Dome—three years in a row—to increase the number of young individuals who attend the game and to increase visitor communication during games. Every year, the services offered are changed. 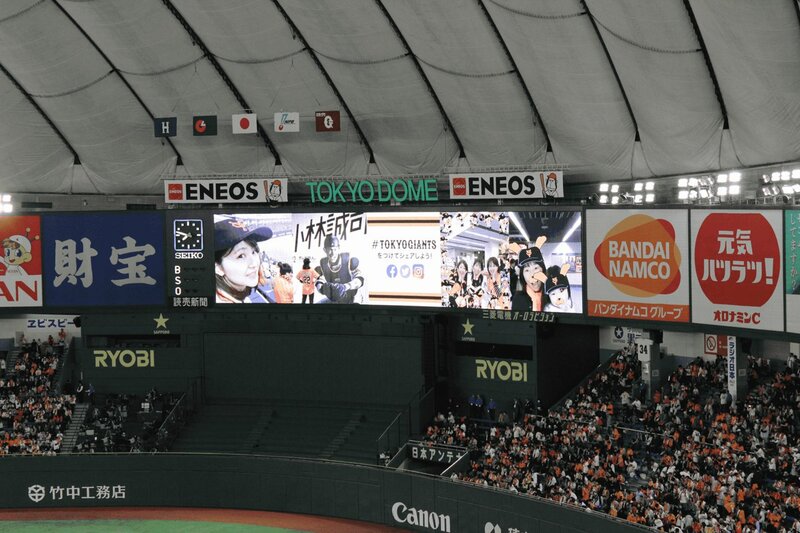 (Digital signage service “#SnSnapWall” which projects images to the big screen is introduced every year) With “#MirrorSnap” introduced in 2017, visitors could turn into the Yomiuri Giants mascot characters, and with #MagicClip” introduced in 2018, movies were captured as if the visitors were standing in the baseball field. These services offered a unique experience to visitors. In addition, photos shared on social media could be printed and taken home or even reflected on the big screen in the baseball stadium, which created a very special moment for participants. This created an opportunity for participants to recapture their photos whether in card-form or on the big screen and share again on social media. This capturing the moment → reposting (on social media) encourages participants to share their experiences which leads to an increase in social media activity. ■ In 2016, social media printing service #SnSnap along with #SnSnapWall, which projects photos with designated hashtags onto the baseball stadium’s big screen, were provided. ■ In 2017, we offered #MirrorSnap equipped with facial recognition technology which can transform a face into the Yomiuri Giants official mascot “Jabbit-kun” along with #SnSnapWall which was provided the previous year. ■In 2018, we offered two services including #MagicClip and #SnSnapPro. #MagicClip shoots videos which captures the participant dancing with Jabbit-kun and official mascot girl “Venus”. #SnSnapPro prints out bright orange cards with the Yomiuri Giants logo.